Estúdios Globo (Globo Studios, in English), formerly known as Projac, is the main center of television production of the Grupo Globo and Latin Americas largest audio-visual production center. Opened in 1995, it is located in the city of Rio de Janeiro, Brazil. Often is called of CGP-Central Globo de Produção (Globo Production Center). The CGP-Central Globo de Produção (Globo Production Center), located in Curicica, Jacarepaguá, is the largest production center in the world, with an area of 1 million and 600 thousand m2, housing studios, fictional cities, islands of editing, post production, special effects, factory settings, costumes, technical support to production, administration and services. Currently, Projac holds twelve recording studios, three snack bars, a restaurant, bank. They are often building new studios, centers support to fictional cities, a theater and an administrative building. In 2016, Projac rename as Estúdios Globo (Globo Studios). 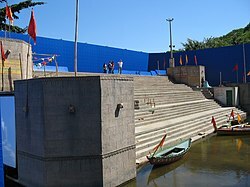 Reproduction of Ganges River to the telenovela India – A Love Story in scenographic city of Estúdios Globo. ^ "INA Global - Television - Article - Organizações Globo". INA Global. Retrieved May 29, 2011.